What's the Easiest Way to Naturally Reduce Body Fat? Your body carries several different types of fat, but the most dangerous kind stretches your waistband and gives you a large paunch. 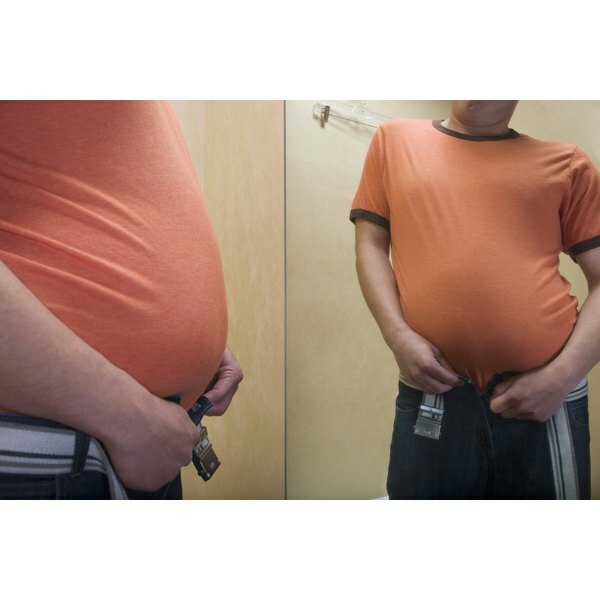 This belly fat -- also called visceral fat -- increases your risk of chronic disease and whole body inflammation. A low-quality diet, sedentary lifestyle, stress and poor sleep habits cause you to gain belly fat readily, especially as you age. Your body contains both subcutaneous fat, which lies just under the skin, and visceral fat, the deep belly fat that surrounds your internal organs. The abdomen has both kinds of fat. Fat that you can easily pinch is subcutaneous, and the type that pushes your midsection out so it protrudes forward is called visceral fat. Both types of fat occur when you eat an abundance of calories -- more than you burn in a day -- but visceral fat is the more deadly of the two. Women through their childbearing years tend to store more subcutaneous fat in the hips, thighs and buttocks; men, however, almost always pack on excess calories as mostly visceral fat. As women enter peri-menopause and menopause, changing hormones make them also store more fat in their bellies. Including certain foods as a regular part of your diet makes it more likely that you'll develop visceral fat. Sugars and refined grains are easy to overeat, so you can quickly exceed your daily calorie goal. These unhealthy foods contain little to no fiber, so they digest quickly, causing spikes in your blood sugar, which leads to a cycle of cravings. The spikes in your blood sugar cause the release of insulin, which encourages fat storage. A study published in a 2010 issue of the American Journal of Clinical Nutrition showed that people who increased calories by eating more refined grains put on visceral fat, compared to those who increased calories with whole grains. Sugar, especially soda and juice, adds calories that are stored predominantly in your belly. Saturated fat found in fatty cuts of meat and full-fat dairy can also encourage your body to develop belly fat. A study published in a 2014 issue of Diabetes showed that overeating saturated fat leads to twice as much visceral fat accumulation as excess fat from polyunsaturated fats, such as those found in avocados, nuts and fatty fish. Make your meals consist mainly of lean proteins and high-fiber foods that slow digestion, such as whole grains, vegetables and fruits. Moderate portion sizes and avoiding processed products also curbs the development of visceral fat. One of the most effective ways to prevent belly fat accumulation is to become physically active. A study published in a 2008 issue of the Journal of Obesity showed that as women become menopausal, the amount of visceral fat they carried increases. These women's physical activity levels decreased significantly in the two years prior to menopause and remained low, contributing to the visceral fat buildup. Another study, published in the American Journal of Clinical Nutrition in 2007, showed that strength training twice a week helps prevent body fat gain in women, especially belly fat. Being more active, even with daily chores and brisk walks, boosts your metabolism so you burn more calories, rather than store them as belly fat. Chronically getting too little, or too much, sleep can cause you to put on belly fat rapidly, too. A study published in a 2010 issue of Sleep showed that in people younger than 40, regularly sleeping less than five hours per night or more than eight hours per night correlates with a higher accumulation of belly fat. Poor sleep interferes with your hormones that control hunger and satisfaction, making you crave more food and preventing you from feeling full. When you're tired, it's also hard to be physically active; you may skip the gym and be less likely to do active chores at home. Stress is another contributor to belly fat. Piles of bills, work deadlines, family obligations and peer pressure can cause you to pump out more of the hormone cortisol, which encourages your body to store fat for easy energy retrieval in times of emergency or famine. Your body doesn't distinguish the stress of an unpaid mortgage, which doesn't require extra energy, from the stress of being chased by a bear, which does. Belly fat stores efficiently in your belly because it has a large blood supply and plentiful cortisol receptors. Finding ways to deal with stress and lack of sleep without turning to food, such as keeping a gratitude journal or practicing yoga, can help you deter belly fat gain.